Rome, Italy&apos;s capital, is a sprawling, cosmopolitan city with centuries of globally influential art, architecture and culture on display. A heady mix of haunting ruins, awe-inspiring art and vibrant street life, Italy&apos;s hot-blooded capital is one of the world&apos;s most romantic and inspiring cities. The result of 3000 years of urban development, Rome’s cityscape is an exhilarating spectacle. 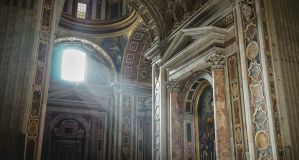 Ancient icons such as the Colosseum, Roman Forum and Pantheon recall the city&apos;s golden age as caput mundi (capital of the world), while its many monumental basilicas testify to its historical role as seat of the Catholic Church. Lording it over the skyline, St Peter&apos;s Basilica is the Vatican&apos;s epic showpiece church, a towering masterpiece of Renaissance architecture. Elsewhere, ornate piazzas and showy fountains add a baroque flourish to the city’s captivating streets. A trip to Rome is as much about experiencing the vivid lifestyle as gorging on art and culture. Restaurants hum with activity and the crowds&apos; mill around popular haunts before heading off to cocktail bars and late-night clubs. 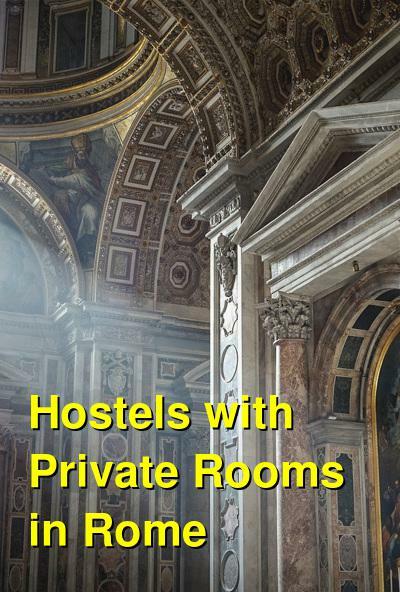 From layers of historic and cultural monuments to entertaining nightlife, Rome has captivate any traveler, and these hostels that offer private room options provide an excellent base for exploring the area. The RomeHello offers comfortable and classy 4, 8, and 10 bed mixed dorm rooms, and there is also a 3 bed women&apos;s only dorm. Each bunk has an individual lamp, USB chargers, plug sockets, and a personal shelf. In addition to the dorm options, the hostel also offers twin, double, and triple en-suite private rooms, all fully equipped. The facility is centrally located near Rome&apos;s central station and only a 10 minute walk from Trevi Fountain, a 15 minute walk from the Spanish steps, the Colosseum, and Piazza Venezi, and a 20 minute walk from the Pantheon. The property offers a 24 hours reception, a kitchen, a lounge, a pub, and a beer garden. Wi-Fi is included with your stay and towels are available for hire. Right behind Fellini’s ”La Dolce Vita” famous Via Veneto, La Controra can be your home while you&apos;re in Rome. The hostel is a warm and peaceful getaway from the hustle and bustle of the Eternal City, as well as a perfect hub to discover its wonders. All rooms are spacious, cozy, no-smoking, air conditioned, fitted with a flat-screen TV and have a private bathroom with shower and hairdryer. Wi-Fi, maps, breakfast, towels, bed linen, and a daily room cleaning are included for free with your stay. The property is conveniently located less than 10 minutes walking from Termini Station (Rome’s main railway station) and 4 minutes from the Repubblica metro stop. La Controra is also within walking distance from the city center and its main sights and liveliest areas, while being in a very quiet and safe neighborhood. The property is within a 5-to-15 minutes pleasant walk far from the Trevi Fountain, Spanish Steps, Villa Borghese, and Piazza Barberini (Metro). There are also plenty of food options nearby. A fancy restaurant, a good pizzeria, and two delicious cafe are just next door. Some of the best restaurants, pizzerie, wine bars, and ice cream shops of the city are only a few steps away. The Hostella is a clean, comfortable, and well located place where, after a strenuous day sightseeing in the eternal city, you can sit back and relax. The facility is located on the first floor of a residential 19th century building, surrounded by restaurants, supermarkets, and laundromats, just a few minutes&apos; walk from the main station Termini and not far from the main tourist attractions. In the cozy guesthouse you can truly feel at home: enjoy the comfort of cooking your own meals in the spacious and colorful kitchen, sit on the couch and watch TV or read in the common area, or chat with the other guests in the common areas. With the availability of private rooms, this gives you a great chance to get to know others while still having the privacy of your own room. The nicely decorated terrace is the perfect place to relax with a glass of wine or a cup of tea. A small breakfast is included for free with your stay and the staff are happy to help with tourist information. Wi-Fi and linens are free with your stay and towels are available for hire. The Beehive is the kind of place where you’ll feel at home. Located conveniently just two blocks from Rome’s central train station, Termini, you won’t have to lug your luggage around town. The relaxed vibe and casually stylish atmosphere at the facility are perfect for unwinding after a day of exploration. Whether you’re traveling solo, with friends or family, or as a couple, The Beehive has a variety of room types to suit all needs and budgets: dorm beds (including several female only dorms), private rooms with shared bathroom, and private rooms with private bathrooms. Their cafe serves organic and vegetarian breakfast daily, communal dinners twice a week, and the property offers weekly cooking classes. Wine, beer, coffee, tea, and desserts are available from the reception staff throughout the day. Guests have access to limited self-catering kitchen facilities. Relax either in the small indoor lounge filled with books, board games and a guitar, or out in the beautiful courtyard garden packed with colorful murals and comfy places enjoy the fresh Roman air. Free Wi-Fi, linens, and towels are included with your stay.